← You could Save a Life: You have two days left! Please know that I will be posting your story on my blog, FB page, Pinterest, and Twitter. Some people have asked me what they should write. Below are some suggestions, but you don’t have to stick to this outline. Be creative. Swearing or talking badly about another person by name will not be allowed. There is no limit on how long it is. However, please try to keep it to one page. If you are interested you are encouraged to include links to your blog, book you have written, or other social media contacts. 2. I would like a picture of you or if you are being anonymous, some kind of picture to include in your story. 3. What illness (es) you have been diagnosed with. 4.How old were you when you were diagnosed? 5. Do you have a good support group? 6. What are the hardest things you face because you have a mental illness? 7. How long have you been suffering from this illness? 9. Are you able to work? What do you do? 10. Do you belong to a support group? How has that worked for you? 11. What helps the most when you start having problems with your illness? 12. 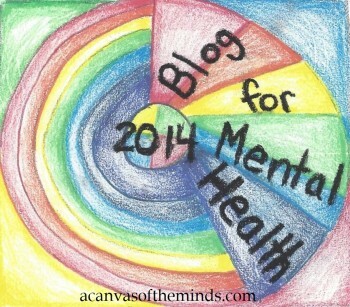 If you have a blog, please include the link. 13. If you want to connect with people via social media, include links to FB, Twitter, Pinterest, Youtube, etc.Like I said, this is just a format and some suggestions. Like I said, these are some suggestions. Please make your story unique. Include a catchy title. When you are done, there are three ways to submit it. 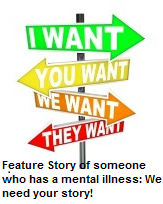 This entry was posted in Uncategorized and tagged bipolar disorder, depression, mania, manic depression, mental illness, schizophrenia, tell your story. Bookmark the permalink. Yes, Mam, I will write you a story. I think I have enough material for one! See you soon!